With Cinderella stories, the antics of emperor Nero, and many tales of love, the Fall Opera Scenes “Baroque, Bel Canto, and Beyond: Scenes by Monteverdi, Handel, Rossini, Donizetti, Massenet, and Puccini” opened Friday, Nov. 16 at 7:30 p.m. This event, which was sponsored by the music department, was followed by an afternoon performance on Saturday, Nov. 17. Both performances took place in the Noble Recital Hall of the Jenson-Noble Hall of Music. Associate Professor of Music Beth Ray Westlund (‘89), Associate Professor of Music Andrew Whitfield, and Assistant Professor of Music Nicholas Shaneyfelt directed these 12 scenes. These scenes came from nine different operas. Alumni Guest Lecturer in Music Rachel Storlie (‘00) and Anne Wilson (‘20) accompanied these performances on the piano. English translations of the Italian and French arias were projected on the back wall of the stage so audience members could follow the story. Mitch Gage (‘19) and Hailey Mork (‘19) perform in their final Fall Opera Scenes as seniors. 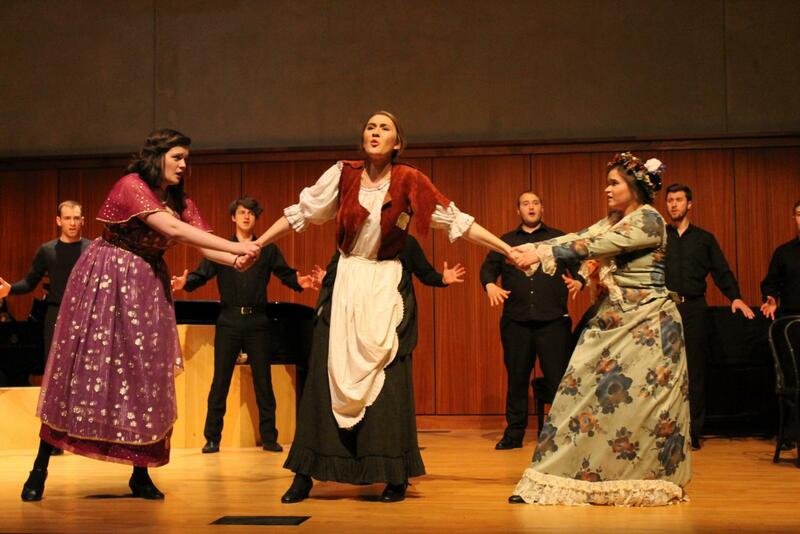 Auditions for the Fall Opera Scenes took place in the spring of 2018, and the selected performers have been preparing for the scenes since the beginning of the fall semester. Shaneyfelt, Whitfield, and Westlund worked together to choose the songs for this performance. Because the directors were more conscious about showcasing students’ abilities, and pushing them to improve, the show did not follow a common theme. Instead, the performance incorporated scenes from a wide variety of operas. The production also showcased two scenes from the opera “L’incoronazione di Poppea,” one in which Nero celebrates the death of his tutor with the poet Lucano, played by Zane Larson (‘19). 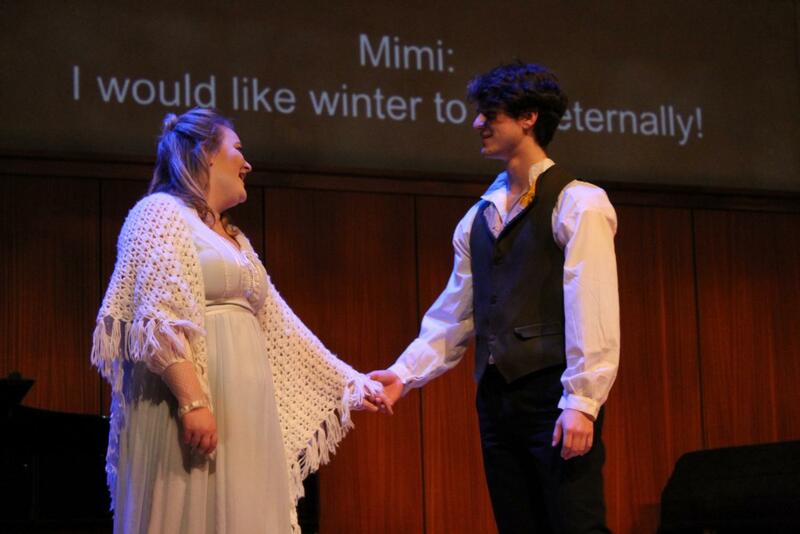 The other scene shows when he bids farewell to his mistress Poppea, portrayed by Mayalyn Cott (‘19). Trevor Haren (‘21) and Jacob Schmidt (‘20) performed as Nero in these two scenes. Taken from the final scene of the third act from “La bohéme,” a quartet was performed by Katie Stuelke (‘19) as Mimi, a young woman dying of tuberculosis; Parker Fretheim (‘19) as Rodolfo, Mimi’s anxious lover; Mitch Gage (‘19) as Marcello, Rodolfo’s friend; and Hailey Mork (‘19) as Musetta, his flirtatious lover. After overhearing Rodolfo’s decision to force her to leave him, Mimi collapsed on stage in a coughing fit. Afterward, she and Rodolfo resolve to remain together until spring. 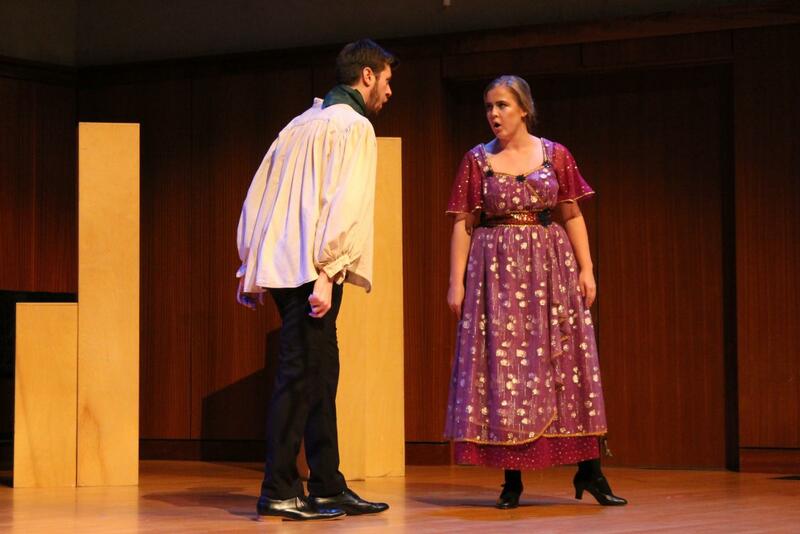 During this exchange, Musetta and Marcello engage in a humorous fight, after which they went their separate ways. The variety of scenes included in this year’s Fall Opera Scenes was enjoyable, according to Stuelke. Audience member Abby Trewin (‘22) enjoyed the show and was impressed with her peers’ performance. “It is amazing what Luther students are able to accomplish, to be able to create such glorious music,” Trewin said. The cast received a standing ovation after both performances.